I love sun-dried tomato anything and everything. It’s such a bold flavor and I feel like they can make any dish come alive with their deep red color. 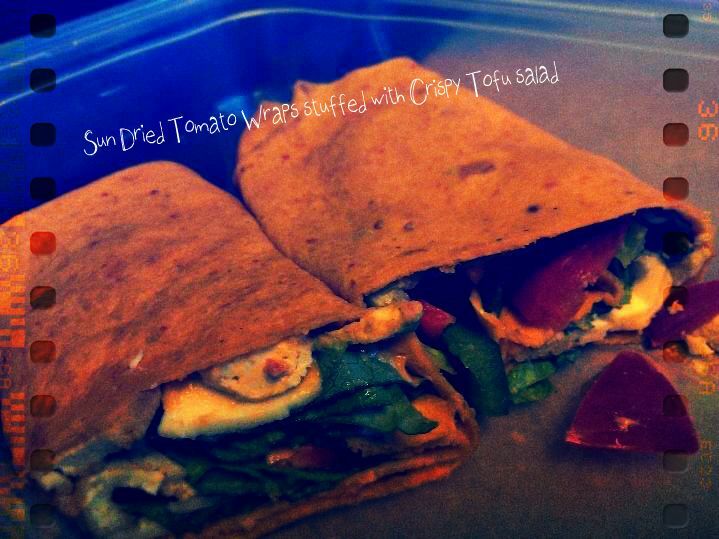 These sun-dried tomato wraps are beautiful, gourmet looking, pretty healthy and pack a bold flavor. I love the bright orange/red color of this tortilla wrap and they can be filled with pretty much anything. The recipe for the sun-dried tomato wrap is perfect for two big mouthwatering wraps, which is ideal for me because I currently only make lunch for my hubs and myself. Here is the deal though, I love cooking and planning in advance in order to save time through out the week. Why only make two wraps when I can make a weeks worth? If you are like me, this is probably crossing your mind. After experimenting with these wraps, I realize they are absolutely amazing when fresh, which means eating them within the first two days you make them. After that, they have a tendency to dry out because this recipe does not require lard (as do most store bought wraps). So trust me when I say you want to eat these when fresh and honestly, after making them, I think you would find it challenging to not eat these right away. In a food processor or blender with a dough attachment, mix the dry ingredients. Add the sun-dried tomatoes and oils and mix. Slowly add in the water and mix again. The dough ball should not be sticky but should be slightly tacky to the touch. If it is too sticky, add more flour. The dough ball should be a bright beautiful color of orange and red. On a clean and dry floured surface, knead the dough for 3 minutes, form a ball and cover with a towel and place a bowl upside down over the dough ball for about 10 minutes. Heat a cast iron flat side griddle on medium heat. Cut the dough ball into half and flatten one half of the dough using a rolling pin. You are not going for a perfect circle but rather a long (kind of) oval-ish shape (think wrap shape) and you also do not want them to be too thick. Once it is at the shape you want place it on the heated griddle and do the same for the other half of the dough. You want to flip them when they start to form small bubbles (after about 1 minute) and cook them on the other side for another minute. NOTE: the thicker the tortilla wraps, the more time they will need before they should be flipped. Once finished, give them a few minutes to cool before filling.